A dream born in the wake of the 1969 Stonewall riots was fulfilled when the Lesbian and Gay Community Services Center Inc. took title to 208 West 13th Street in December 1984. Today The Center welcomes more than 300,000 visitors every year and provides social, cultural, wellness and health-based programming to support the vibrancy of the LGBT community in NYC. Use the timeline below to get a glimpse into the history of our organization and how – through our support and that of others – life for LGBT New Yorkers has continued to evolve. The Center is founded in 1983. The Founders incorporate Lesbian and Gay Community Services Center Inc. on July 6. The Center at 208 W 13 St. The City and The Center close the deal and Lesbian and Gay Community Services Center Inc. takes title to 208 West 13th Street. At the Second Tuesdays Event, Audre Lorde reading at The Center. The Center launches its first cultural program, Second Tuesdays, led by board member Diana Leo, to bring prominent figures from the arts, politics and academia like Audre Lorde, Fran Lebowitz and Quentin Crisp to speak directly to the lesbian and gay community. Coalition for Lesbian and Gay Rights demonstration to end discrimination against gay and lesbian people in 1986. Pioneering lesbian activist and leader Eleanor Cooper, a founder of Lesbian Feminist Liberation in the early 1970s and of the Coalition for Lesbian and Gay Rights that guided the City’s gay and lesbian rights bill to victory in 1986. The New York City Council passes the Gay Rights Bill, banning discrimination on the basis of sexual orientation in housing, employment and public accommodations. The Coalition for Lesbian and Gay Rights – a tenant of The Center and the leading community organization promoting the bill – sponsors a public celebration that brings an overflowing crowd and mainstream media into the building. At the In Our Own Write Event, readings were done by Vito Russo, Larry Kramer, and Assotto Saint. Activist, author and playwright Larry Kramer appears at Second Tuesdays at The Center on March 10. He rages at the government’s unresponsiveness to the AIDS crisis and motivates the crowd to create ACT UP, the AIDS Coalition to Unleash Power. At the Quilt Project Workshop on February 2, 1988; 1st row; Candida Scott Piel, Harvey Fierstein - 2nd row; Wes Cronk, David Nimmons. Project Connect Director, Barbara Warren, and Chair of Advisory Committee, Philip Spivey on December 1, 1988. Volunteers create the Quilt Workshop at the Center as part of the national effort to create panels for the NAMES Project AIDS Memorial Quilt. Panels are displayed on the Great Lawn in Central Park in June and later on the National Mall in Washington, DC. At the In Our Own Write Event on October 2, 1989 are participants from the Hetrick-Martin Institute. The Center begins offering services for families. The Youth Enrichment Services program (YES) is launched with new grant funding, and the staff develops ground-breaking programming for LGBT young people in a positive, healthy, alcohol- and drug-free community environment. A group of lesbian and gay parents asks The Center to take on their fledgling program called Center Kids, and they volunteer to create services and provide support to LGBT people who want to start families. During a Second Tuesdays Event, David Dinkins is accompanied by Richard Burns in a tour of The Center. At the Lesbian and Gays for Jackson Event, Marjorie Hill, Rev. Jesse Jackson, Allan Roskoff, and David Dinkins spoke. David Dinkins makes his first scheduled visit to The Center as mayor of New York City to participate in the Second Tuesdays series. Orientation on the Road makes its debut in Brooklyn, where more than 70 people attended to hear about lesbian and gay activities in their neighborhood and at The Center. The Vito Russo/Pat Parker Center Library. This is a joint project with The Publishing Triangle. At the CenterBridge - Shanti Project are attendees, Eric Rofes, and Dana Rose. The Pat Parker/Vito Russo Center Library opens at the Center. The brainchild of Stan Leventhal, Kevin Jenkins and Brian Phillips, it is co-sponsored by The Publishing Triangle, and starts out with 500 volumes on racks that are rolled into the first floor assembly hall for library hours. On December 8, 1992, Richard Burns accepts the Lucy G. Moses Preservation Award. In the background are Kenneth Knuckles, New York City Commissioner of General Services, and Francoise Bollack, The Center Architect. At the Joan Rivers and Her Funny Friends Event on October 5, 1992, Joan Rivers chats with Charles Ching (Coco Chanel). The Center, along with architect Françoise Bollack, receives several awards for its façade restoration, including the NYC Landmarks Preservation Commission Certificate of Merit, The New York Landmarks Conservancy Lucy G. Moses Preservation Award, and The Metropolitan Chapter of the Victorian Society in America’s Certificate of Merit. The façade restoration was made possible by a matching grant from Stanley & Rita Kaplan, parents of board member Paul Kaplan. Joan Rivers hosts “Joan Rivers and Her Funny Friends,” featuring an illustrious cast of dozens of prominent lesbian and gay entertainers, at a gala benefiting The Center at Town Hall. The April 25, 1993 March on Washington. The Center and other organizations charter buses to the National March on Washington for Lesbian, Gay, and Bi Equal Rights and Liberation on April 25. A million people attend the March. The June 26, 1994 Gay Pride (Stonewall 25) March on the U.N.
On the 25th anniversary of the Stonewall Riots, New York City hosts Gay Games IV, a lesbian and gay athletic event with more than 250,000 participants and spectators from around the world. Many New York athletic teams meet and organize at The Center. Closing ceremonies are held at Yankee Stadium. From June 24 to July 3, the Center International Lesbian and Gay Association (ILGA) Committee hosts the 16th Annual ILGA Conference, which also co-hosts Stonewall 25 commemoration events in the City. In June, lesbian and gay community centers from around the country convene at The Center for the founding convention of the National Association of Lesbian & Gay Community Centers (now Centerlink). The 12th Annual Garden Party on June 19, 1995. At The Center’s longest-running fundraiser, the annual Garden Party on June 19, Board President Judith Turkel announces Center Challenge: The Campaign for Our Future, a capital campaign to renovate The Center’s 153-year-old facility and bring it into compliance with City building codes. Ashley Merriman advertises the Promote the Vote Event on July 6, 1996. The Center begins Promote the Vote, America’s largest nonpartisan lesbian and gay voter registration and mobilization program at the time. Center Founding President Irving Cooperberg (left). The Center’s founding President, Irving Cooperberg, dies of AIDS in August. In April 1993, the Weekend Renovation Committee participant, Andrew Gessner, helps paint the Assembly Room at The Center. Matthew Sheppard - 1976-1988, seen in the Out at The Center video in July 2006. Video of Center capital construction in the building at 208 W 13 St.
Over Labor Day weekend, The Center relocates to One Little West 12th Street in the Meatpacking District, so that renovations can begin at 208 West 13th Street. On October 7, Matthew Shepherd is brutally attacked in Wyoming. Five days later, on October 12, he dies due to the severe injuries sustained in the attack. Online volunteer applications to The Center jump to an all-time high. The Center creates SpeakOUT, a community organizing and policy program for people in recovery from alcohol and drug abuse. Cherry Jones is being interviewed at The Times Talks Event in 2003. Carol Channing at The Times Talks Event in 2003. Vice President Al Gore and former Senator Bill Bradley visit The Center separately and address large, enthusiastic crowds while on the campaign trail for the U.S. presidential primary. First Lady and candidate for the New York State Senate, Hillary Rodham Clinton, appears at the Center to address our community. Eartha Kitt, Audra McDonald and Bernadette Peters visit The Center as part of the Times Talks series “Broadway Divas as Gay Icons,” produced jointly by The Center and The New York Times. The Founders Society Reception - Kaplan Party on May 1, 1989 was attended by Stanley Kaplan, Barbara Praimin, Dino Georgiou, Paul Kaplan, Richard Burns, and Mark A. Bieber. In July The Center moves back to 208 West 13th Street as the $14 million renovation is completed. The building is dedicated as The Diamond/Kaplan building in honor of the million dollar lead gift from Shelley Kaplan and bears a new sign with a new name: The Lesbian, Gay, Bisexual & Transgender Community Center. On September 11, staff at the Center’s One Little West 12th Street location staff a water station for people fleeing lower Manhattan after the attack on the World Trade Center. On October 1, nearly 1,000 community members and allies gather at the Center to remember and honor those lost in and affected by the September 11 terrorist attacks. At the Causes in Common Event in 2003 are Tiana Bien-Aime, Sean Cahill, Ruthann Robson, and Carmen Vazquez. Project Connect staff, Barbara Warren, and Stephanie Grant. The Ford Foundation provides a grant that allows The Center to create Causes in Common, a program that provides the infrastructure for cross-movements building between the LGBT and reproductive justice movements. The Center’s separate mental health and social services programs (Project Connect, CenterBridge, Gender Identity Project and Project Outreach) merge to form a comprehensive health and wellness program: Center CARE. The CyberCenter Opening on January 6, 2003. The David Bohnett CyberCenter opens at The Center, made possible through generous funds awarded in 2000 by The David Bohnett Foundation. Visitors use the David Bohnett CyberCenter to surf the net, take classes, meet friends and seek services. Center community members in Washington, DC, for The March for Women’s Lives. Dozens of organizations sign the Pledge of Commitment to join Causes in Common, The Center’s national organizing project that brings together activists representing the LGBT Liberation Movement and the Reproductive Rights and Justice Movement. On April 24, busloads of supporters travel to Washington, DC, for The March for Women’s Lives. Promotional material from The Center's 2005 Promote the Vote campaign. During President George W. Bush’s administration, The Center neither receives nor has renewed one single direct federal contract for funding. Executive Director Richard Burns celebrates 20 years at the helm of The Center. In 1987, shortly after Burns joined the Center, it was facing foreclosure on its mortgage. In Burns’ 20th year, The Center employs a staff of 80 and has an annual budget of $8 million. At the Garden Party in June, City Council Speaker Christine Quinn and Borough President Scott Stringer announce a multi-million dollar commitment to The Center’s renovation project from the Council, the Mayor and the Borough President. In November, Center CARE Recovery becomes the first LGBT treatment program licensed to accept insurance and Medicaid in New York State. In the first six months, 243 people benefit from the program. The Center celebrates its 25th anniversary by serving as Grand Marshal for the NYC Pride March, and producing programming throughout the year featuring notable names such as Elaine Stritch, Harvey Fierstein, Kate Clinton and Edward Albee. Two long-time Center staff members are also recognized: Barbara Warren, a 20-year staffer, and Robert Woodworth, who has worked for the organization for 25 years, since The Center’s founding in 1983. In February, Richard Burns completes his 22-year tenure as executive director and moves to the Arcus Foundation. In November, following a national search, Glennda Testone begins her service as executive director. She comes from leadership positions at GLAAD and The Women’s Media Center and is the first woman to hold the position. The Center launches the LGBT Foster Care Project, a collaborative effort with the New York City Administration for Children’s Services (ACS) to increase the number of homes for all youth with a special emphasis on LGBTQ youth. Couples celebrate the passage of marriage equality legislation in New York State at The Center’s Wedding Reception. George Takei at The Center’s Wedding Reception. Grooms at The Center’s marriage equality celebration and reception. Brides at The Center’s marriage equality celebration and reception. The New York State Marriage Equality Act takes effect on July 24. On that day, The Center welcomes newly-weds and their friends and family to a wedding reception in tribute to their love and commitment; 350 people attend. Invitation to the unveiling reception of Keith Haring’s restored “Once Upon a Time” mural at The Center. Video of Keith Haring’s “Once Upon a Time” mural at The Center. The Center unveils the newly restored Keith Haring mural, “Once Upon a Time,” at a special reception. In honor of Haring’s life and work, The Center dedicates the month of March to programming designed to celebrate the mural and Haring’s legacy. Partners include the Armory Show, the Brooklyn Museum, Visual AIDS and the Keith Haring Foundation. After Hurricane Sandy destroys the Ali Forney Center’s drop-in facility, The Center quickly steps in to provide temporary space so that AFC may continue to provide its programs and services to LGBT homeless youth while a permanent new space is arranged. Edie Windsor, a long-time Center friend, challenged DOMA’s discriminatory policies by bringing her case all the way to the Supreme Court and, with her victory, took a significant leap in achieving equality for lesbian, gay, bisexual and transgender people. Edie’s press conference in response to the announcement was held at The Center. Groundbreaking Reception held on November 8, 2013 at The Center. The Center breaks ground on a $9.1 million capital renovation, made possible by a combination of city, state and private funding. The building enhancement project will last through much of 2014, and will transform the space into an upgraded facility ready to welcome, support, entertain and enrich the lives of LGBT New Yorkers in the years ahead. The Pat Parker/Vito Russo Library and The Center's National History Archive at The Lesbian, Gay, Bisexual & Transgender Community Center. Photography by Travis Mark. New York City Council passes legislation that removes the surgical requirements for transgender residents to correct their gender markers on their birth certificates. The Center reopens the Pat Parker/Vito Russo Library and the National History Archive in its new location on the fourth floor. Part of The Center’s ongoing $9.2 million renovation, the shared, light-filled space provides archival quality storage shelving, approximately 1000 linear feet of library storage and work space for volunteer archivists and visiting scholars. After many years of advocacy, The Center celebrates the New York City Council’s overwhelmingly affirmative vote in December to pass legislation that removes the surgical requirements for transgender residents to correct their gender markers on their birth certificates. The Center completes a $9.2 million renovation, transforming the majority of the main building and garden, resulting in a dramatically improved space in both function and atmosphere. The project was made possible through funding by both New York City and State, complemented with private contributions exceeding $2.6 million. Founding staff member Robert Woodworth retires in December after 32 years of service. Robert’s vision, leadership and tireless commitment to the mission of The Center was unshakable. During his tenure, Robert led multiple successful capital campaigns and renovations, and developed the infrastructure for many of the organization’s foundational programs, including information and referral, meeting and conference services, and a myriad of arts and cultural programs and series. In response to community need, The Center launches new economic and career development initiatives to combat the unique challenges faced by women, immigrants, trans and gender nonconforming people. In addition, The Center creates the nation’s first outpatient substance use treatment program for LGBT youth, ages 13 and up. The Center is awarded a contract to administer The New York State Lesbian, Gay, Bisexual and Transgender Health & Human Services Network (The Network). Founded in 1994, The Network is a coalition of 51 LGBT-specific and supportive non-profit organizations that provide care to LGBT New Yorkers and their families. The Center announces the launch of a new advocacy program at Center Dinner, which raises a record-breaking $1.8 million and honors Hillary Rodham Clinton. On Sunday, June 18, Senator Chuck Schumer announces a $1 million grant from Google.org to The Center to create the Stonewall National Monument digital experience. News of the grant reaches far and wide, and a crowd of hundreds sporting shirts with custom illustrations by artist Daniel Arzola join The Center in celebration at the annual NYC Pride March. The Center launches the RiseOut People’s Platform to represent a shared vision of justice and equity for the future of the LGBTQ community in New York State. Community leaders from every region in New York worked in collaboration to develop this inclusive, people-centered plan. New York City passes legislation to include a third gender category, “X,” on birth certificates and to discontinue the need for a doctor’s note or health care provider’s affidavit to change one’s gender marker. Responding to community need, The Center expands HIV support services and increases HIV testing hours to five days a week, expands services for LGBTQ immigrants and launches the first ever TGNC Career Fair. 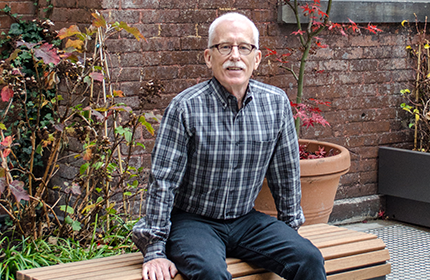 The LGBT Community Center National History Archive, founded in 1990 by volunteer archivist Rich Wandel, works to preserve the rich history of the LGBT community. The collection includes thousands of papers, periodicals, correspondence and photographs donated by LGBT individuals and organizations. The archive is accessible at The Center by appointment, as well as through online digital galleries featuring various time periods and topics. To make an appointment or to inquire about donating to the archive, email archive@gaycenter.org. Women in mixed-gender clothing – c. 1920. Honor Guard Company Party – Tokyo – 28 Mar 1953. Lesbian couple – c. 1970s. SAGE – New York City – 1979. To find out how to get involved in a specific community group please visit Community Groups. For information on the next meeting for a specific group, please access our complete Calendar.